You know those stunning photographs with bungalows hovering over lucid turquoise waters, and you immediately think of paradise. But are tropical destinations like Bora Bora the best choices for families? The Four Seasons Bora Bora is on many bucket lists. My family and I live in Los Angeles, and— like most California families— Hawaii is a go-to destination for family vacations. We love the Four Seasons Hualalai on the big island where we have been many times. 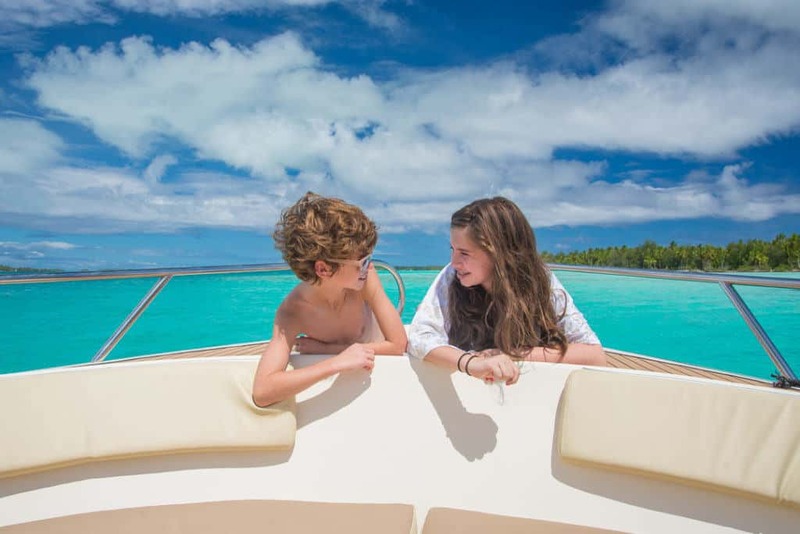 With my children old enough to travel long-haul flights with relative ease, we thought it was time to try a more far-flung destination like Bora Bora for a new family adventure. I don’t think, however, I had accurate expectations of what a vacation in such an exotic destination would be like, so I’d like to prepare you if you’re considering a trip to Bora Bora. Traveling to Bora Bora is really exhausting, and I would not recommend the trip to anyone with young children, even road warrior children like mine were. We left Los Angeles at 11:30 pm on a Sunday night, and Air Tahiti has this routine down. We boarded the very brightly decorated plane and were all sleeping within 20 minutes. Lights were out, and we snoozed comfortably, even in economy, for a good six and half hours. The remainder of the eight hour flight flew by, and we were on the ground in Papeete, Tahiti. Tip: Arrange a driver in advance to explore Tahiti during long layovers to keep the family happy. Sadly, this airport is really miserable. It is hot and humid, even at 7 am, and there are long layovers between flights. There are two restaurants, and the best option is McDonald’s, which is really saying something. Do not eat in the cafeteria. The airport has little to do, and the time crawls by. This three-hour experience was so unpleasant that we asked our hotel to arrange a driver to pick us up during our six-hour layover en route back to Los Angeles who could take us to dinner and shopping to pass the time. We finally boarded the flight to Bora Bora, and it was beautiful. The Four Seasons had a lovely boat waiting to take us to the resort. The crew provided fresh wet towels and Evian water for our 15-minute ride. We were disappointed with the arrival process at the Four Seasons. The staff provide a tour of the property while they stow your luggage. Even with the predictable number of arrivals from the limited flights, they do not have a smooth process for dealing with guests who arrive before their rooms are ready. What they need is an arrival-departure lounge like the one they have at the Four Seasons Orlando. The manager told me a reception center is in the works. The most obvious answer is to change into swimsuits and relax poolside until rooms are ready, but they wanted us to look through our bags in the middle of the reception area. I wasn’t comfortable with that option, so they took us into a small security room that had no lighting or air conditioning and expected us to change in a dark bathroom. It just wasn’t how I wanted to freshen up after a twelve-hour journey. 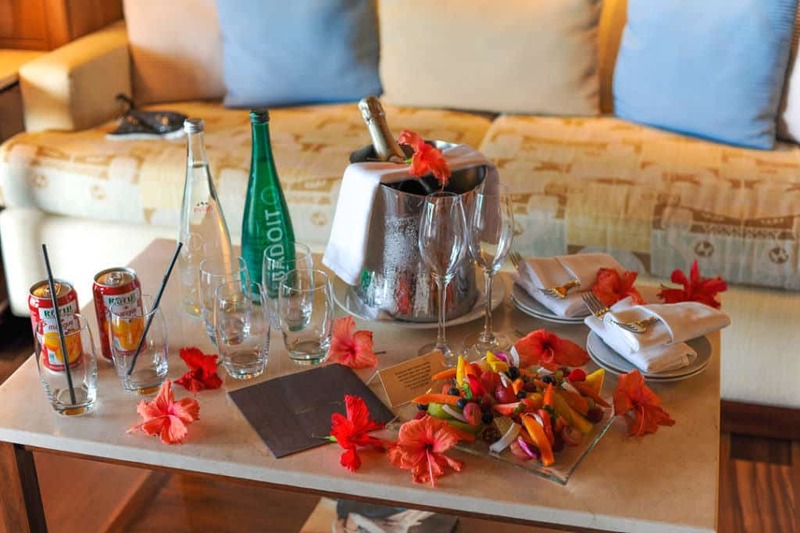 A lovely family welcome to the Four Seasons Bora Bora bungalows with Champagne and tropical fruit. 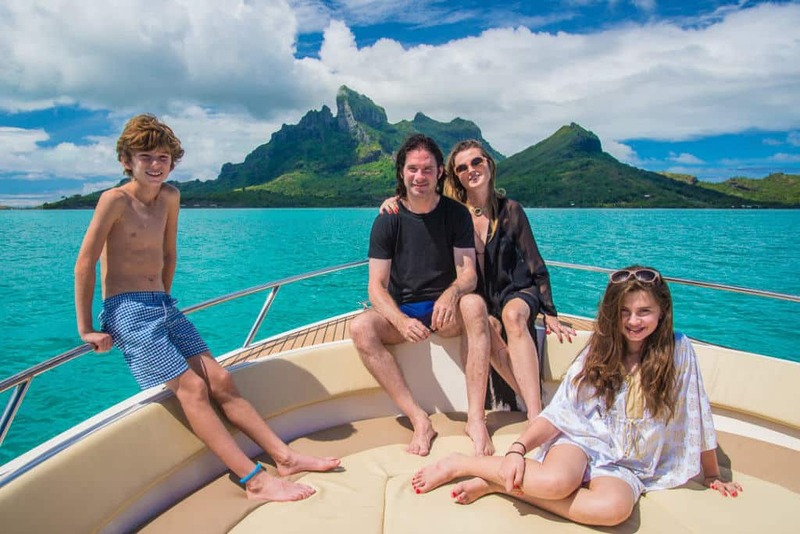 I was starting to have doubts about booking this vacation to Bora Bora and staying at the Four Seasons but to their credit, they did take the kids off to the kids’ club and feed them lunch while we struggled to find our bathing suits and sunscreen. We met another guest that joked that the snafus with check-in almost ended his new marriage. His wife was unable to find everything she needed while rummaging through her suitcase in the lobby and became extremely sunburned on the first afternoon of her honeymoon. Tip: Place a pool bag with all swimsuits, flip-flops, hats, and sunscreens inside your luggage in an exterior pocket for immediate access upon arrival. Things turned around for us when we had lunch at the Sunset Restaurant, and they gave us complimentary champagne. The champagne was delicious, and so was the food. All was forgiven because it is really hard to stay mad at the Four Seasons Bora Bora. It was during this first meal that I mentioned my dairy allergy, and every staff person thereafter warned me of potential dangers. For example, when my husband ordered a piña colada, they warned him not to share with me. I was very impressed with the food and beverage service. Our smiles grew even bigger when we were taken to our bungalow above the water. They thoughtfully placed us in one above shallow water so that our kids could step off of the deck at anytime into waist deep water. The bed in our room was very comfortable. They provided robes, flip-flops, and a beach bag. 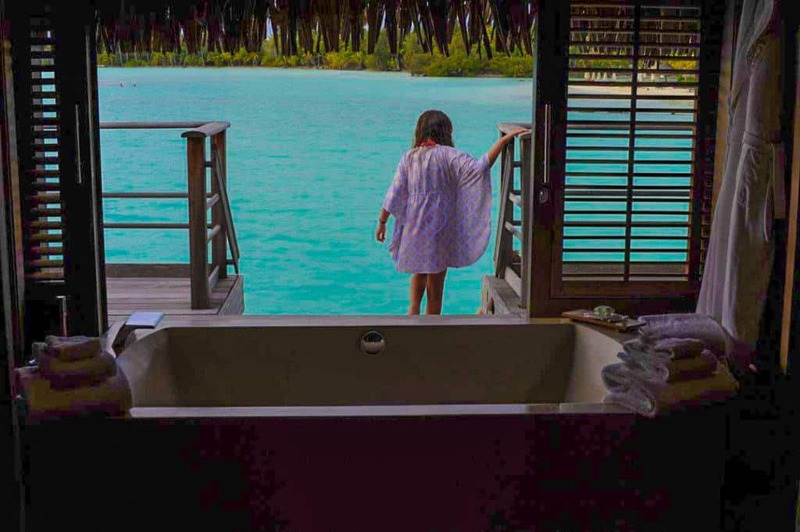 The bungalows at the Four Seasons Resort Bora Bora wwork well for families, as a large bathroom separates the master bedroom and living room. Our bunglaow was over shallow water my kids could wade in for safety. Tip: Confirm with the resort the best accommodations regarding water safety and your children. The room is perfect for a family because it has a living room with a pull-out sofa and big television separated from the master sleeping area by a large bathroom in the middle that included a shower and my favorite thing — a bathtub overlooking the lagoon. Between the lagoon view bath tub and the outdoor shower, we were very clean during out visit and loved these features. My son kept asking why I was taking so many baths. I told him because it was paradise. It’s all about the turquoise water, right? The pool is paradise – it’s perfect temperature and beautifully situated. The pool staff come around with water and little treats throughout the day and the resort provides high quality sunscreen in multiple locations. Families can grab one of these large cabanas at the pool and remain dry through short tropical showers. If you get to the pool area early you can reserve (at no additional cost) an amazing, enormous cabana. We really enjoyed spending time in the cabana. On a rainy day, this was a lovely way to enjoy the beauty of the property while staying dry. Tip: Grab a complimentary cabana to stay dry during tropical showers. Both sunscreen and hats are necessary. Pack one, or the resort shop sells baseball hats for $50. Swimming in the lagoon is perfect for kids – no waves or rocks, lots of fish and other wild life. There are many interesting fish and creatures like the eagle rays and the sea cucumber that we loved seeing under the bridge each morning. My son loved that he could see the bottom of the water at all times. He gets scared of going into “the deep end of the ocean” and this was the first time he ever really seemed at ease on the beach alone. Our entire family enjoyed paddle boarding when it was not windy. Paddle boarding will certainly highlight your weak areas — I learned quickly I needed to up my game on my back routine when I returned to Los Angeles. The gym was stocked with water, apples, and refreshing face towels that smell divine. They also offer fitness classes throughout the day. Some classes are complimentary while others require a small fee (It seemed like about 20 for most). A menu of what is on deck for the day is delivered the night before. Although there are many activities offered, families will be in their swimsuits most of the time near or in the water at the Four Seasons Bora Bora. The first night we attended the Polynesian show, and it was incredible. The food was served family-style, and it was a great way for the children to try the traditional Polynesian food. We enjoyed dance performances and fire-eaters. This is not a hokey luau; it is a beautifully done dance show followed by an exciting fire performance. We were enthralled. Our children loved these shows and rated them among their favorite things about Bora Bora. I must admit we did get some dirty looks when we were seated at tables with our children next to all newlyweds, but our kids won them over with their good manners. There were a couple of other families at the resort, but we were in the minority taking our children to dinner. Tip: Respect that most guests are honeymooners, so employ sitters for younger children at evening meals. One of my favorite things about Four Seasons is the Kids for All Seasons program, free for resort guests during the hours of 8:30 AM to 5 PM for children ages 4 and older. Our kids, aged 9 and 10 loved participating. Their activities including collecting sand crabs and using them as bait for fishing, paddle boarding, snorkeling, arts and crafts. The staff is amazing and patient. My son did not want to use the sand crabs they collected as bait. They were very understanding and agreed to let him free his collected crabs. My daughter got a reef rash while snorkeling, and they provided attentive care when dressing her “wound”. I felt totally comfortable leaving my children with the kind and knowledgeable staff, which is good, because they wanted to be there much of the time. We chartered a boat to explore the surrounding area by boat and snorkel, and it was incredible, one of the best memories of the trip for us as a family. For me, the best food of the day was breakfast. They make crepes and Eggs Benedict to order, and the buffet is amazing. One of the resort experiences is breakfast by canoe, but we didn’t do that. We were there during early December’s low season, so there were fewer options each night for dinner: a special experience like the Polynesian show, the barbecue, or the gastronomic restaurant; Sunset Restaurant & Bar – which is mostly sushi; and in-room dining. In-room dining is a great family option because meals are set up on the bungalow balconies overlooking the water, and the menu is large and varied. We enjoyed the special experience option. While it was delicious, the barbecue is not really traditional American barbecue as much as a mixed grill. My least favorite option for our family, not surprisingly, was the formal restaurant. Every restaurant was still very accommodating for our children and my dairy allergy. So here’s the bad news. This exotic paradise lures not only people but all things. Prepare to share this tropical climate with bugs, and lots of them. It is not feasible to keep bugs like termites out of these wooden bungalows. If you are squeamish about things like this, consider that the over-water bungalow vacation may not be for you. My son and I developed a terrible allergic reaction to something while at the resort, and we were truly miserable for two days. We do not know the source of this rash, but we wished we had packed Benadryl and other sundries, as there is no Walgreens or CVS nearby. We had nothing but aloe to ease our itchiness. Tip: Pack medical kits for your family as if you were going camping. On our return, we still experienced some snafus. Flights for Los Angeles leave at a brutal 1 AM departure, and I dreaded a rough trip home. Had we been without our children, I am not sure if I would have been as stressed by the flights, but parents expecting resort vacations similar to those in Hawaii or the Caribbean may be surprised that even the Four Seasons cannot tame every aspect of a tropical climate like Bora Bora. My kids absolutely loved this vacation and found the resort to be a paradise. I’m very glad we went once, but I don’t think the rough travel path to get there would make me go back, and I now know not to expect an easy resort vacation. I know this is a destination on so many people’s bucket lists. Is it still on yours? Marisa DeSalvio is passionate about planning exotic family vacations and honeymoons around the world. Bora Bora is truly a once in a lifetime trip for families. It’s exactly the kind of exotic destination vacation I love booking. As a former teacher, I understand the importance of children spending time relaxing and exploring new worlds and experiences with their families. 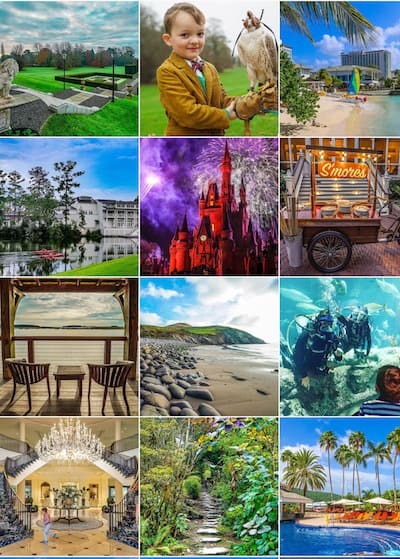 Why not create let me create an unforgettable vacation that will be some of children’s favorite childhood memories? As a luxury travel advisor, my special VIP treatment will make it an equally wonderful memory for you, too! My agency, DeSalvio Travel, has access to exclusive discounted rates, resort credits, free breakfasts, and personalized welcome amenities. Imagine the look on your children’s faces when they walk into the bungalow for the first time and see a picture of their dog from home or their names written on a chocolate treat! Sure, you could book your trip to Bora Bora or the Maldives, or Dubai on your own, but you’d miss out on hundreds of dollars in exclusive amenities, as well as personal VIP treatment by the staff at Four Seasons. Why not let me make your trip a little extra special at no extra cost to you? Please get in touch to set up a vacation consulation. I loved reading your story, I’m going to book this week for myself and two daughters aged 16 and 12. Question about the bugs… are we talking tropical roaches/ palmetto bugs in the room? Or just the occasional termite? How are the mosquitoes? What was the name of the boat company your chartered? So definitely we should probably take a red eye so that my girls sleep on the plane? Thanks!